"I've missed more than 9000 shots in my career. I've lost almost 300 games. 26 times, I've been trusted to take the game winning shot and missed. I've failed over and over and over again in my life. And that is why I succeed". And then, my favorite - Ross Perot said that many people succeed because "They are too dumb to quit". Here is a scam that's been going on for years. My clients - freight brokers - after getting assigned their MC#, receive an official-looking letter or email with the broker's name and MC#. On the heading, it reads, "MANDATORY D.O.T. TRAINING"
It goes into detail about the requirements for DOT drug and alcohol awareness training and they offer a $99 online course. Just pitch this letter if you are a broker. The company scamming brokers is Supervisor Compliance Training Department in Wilmington, DE. Their phone number takes you to a recording. Their rating with the BBB is "F". I wish I had the time to deal this scam a blow. Nevertheless, do NOT fall for this scam if you are a broker. The California Drought - What's Going On? You hear about the drought - the need for rain is desperate in some areas. After all, California is one of the biggest bread baskets for produce growers. I don't know how many tons of produce have been lost due to the lack of water, but it probably is sad. People are losing their jobs over this. But, what's going on? Is it the weather --- or is it something else maybe? What could it be? "While farms and businesses are starved of water, more than 81-billion gallons of water have been allowed to flow out to the ocean—off limits to human use or consumption, thanks to federal regulators’ environmental extremism. That’s enough to put 85,000 acres of farmland back into production". 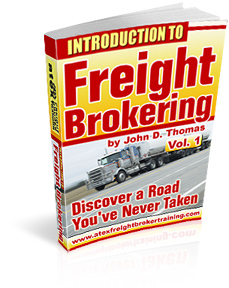 If you have not signed up for my f.ree eBook, "Introduction to Freight Brokering", then you will not receive periodic emails on different aspects of freight brokering. Go to my Home Page at www.atexfreightbrokertraining.com and sign up to receive the eBook. Thereafter, you will receive periodic emails usually with practical and useful information. You won't be spammed and you can cancel anytime. The younger generations especially are mastering the art and science of sending emails and text messages. But, is there more to communications? According to some colleges and universities with supply chain and logistics programs, it may be more effective to make a phone call or pop into someone's office as mentioned in the magazine, Inbound Logistics. There is a growing trend in thought with some that texting and emails are enough. This mindset is being tempered with schools teaching the use of good old-fashioned means of communication. Some schools offering Logistics and Supply Chain programs include Auburn University, Cal State Fullerton, East Carolina University, Elmhurst College, Georgia Institute of Technology, Iowa State University, Marquette University, MIT, University of Maryland, University of Denver, Western Illinois University, University of Central Arkansas and others. Net Neutrality - want to keep the Internet free and open? In about 16 days, Congress will vote on something near and dear to just about every American. Powerful lobbyists and even the director of the FCC want to curtail individual rights as far as using the Internet is concerned. You can enter your name and email address and get the phone numbers of your representatives. Call them and make a difference in this world. Title X is supposedly a false effort to give Internet freedom. Explore this website and make your own decision. Where did "Rule of Law" begin? You know you have liberties. You know you are free for the most part to do what you want to do. Millions of peoples in many, if not most, countries do not have what you and I have. We are at the 800th Anniversary of the Magna Carga. Attacked by a Wolf !!!??? What if you were attacked by a wolf? A vicious wolf with razor sharp fangs? What if you were alone and helpless? What would you do? Maybe use a little magic and change into a wolf to level the playing field? You cetainly would not want to change into a sheep! Ben Franklin said many years ago, "If you act like a sheep, you're going to attract the wolves". This is exactly what is playing out on the international field of politics and conflict. The U.S. has been acting like a sheep. And, you don't have to guess what is happening now and what is going to happen next. Here is an unassuming college professor of economics knocking down a giant. He not only beat his opponent, he clobbered him. What does this all mean? Honestly, political commentators are scratching their heads. To me, it means that we still have people that want to continue conservative principles in the halls of Congress. I'm particularly concerned about the wreckless spending and big government. We will see in time where this is all going. But I'm happy to see this.